Tweaking.com Hardware Identify is a freeware application which displays a list of the various hardware devices installed on your system without requiring expert knowledge. 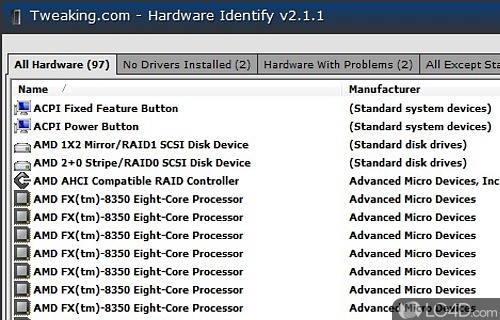 Using Hardware Identify is straightforward and scans your PC within a matter of seconds, displaying a list of connected/installed components in a list. The list contains various details such as the manufacturer, error codes, item class, the version of the driver installed along with other potentially useful details. Right-clicking on an item provides you with options to search Google for either the hardware name or the ID. You can also copy the whole items based on different criteria to the clipboard. 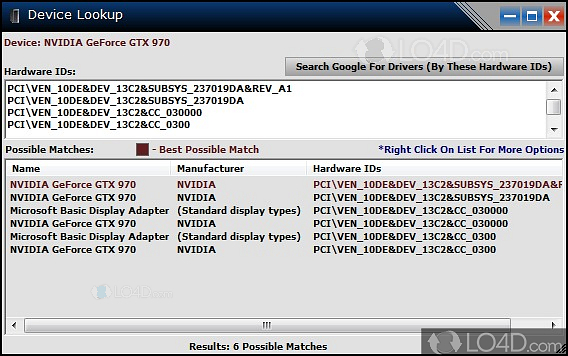 Included with hardware with drivers installed, Hardware Identify can also display items which have not yet been installed; this can be useful when trying to find drivers for unknown components. Copying the specific data doesn't necessarily provide a purpose for novice users, but can be quite useful when seeking technical support by email. In all, Hardware Identify is a useful program with a basic purpose and it does it without any hitches. If you need specific details about any components or hardware connected to your PC, then Hardware Identify should come in handy. 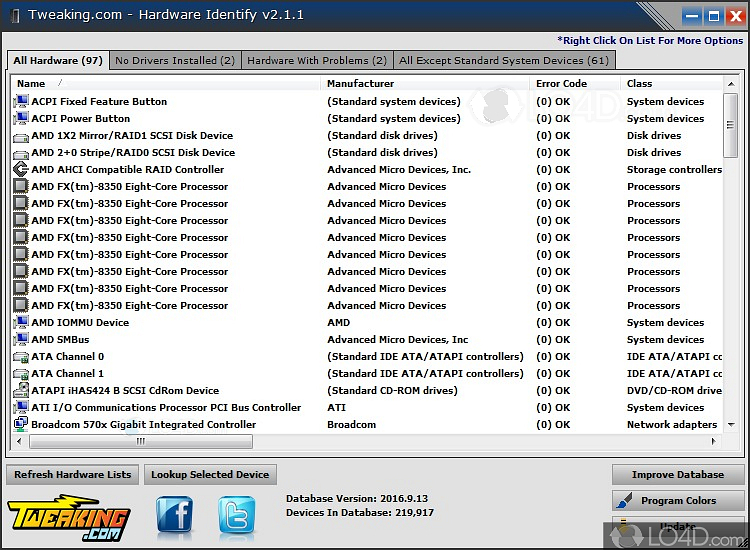 Hardware Identify is licensed as freeware for the Windows (32-bit and 64-bit) operating system / platform from hardware diagnostic software without restrictions. Hardware Identify 2.5.0 is available to all software users as a free download (Freeware). Compatibility with this hardware identifier software may vary, but will generally run fine under Microsoft Windows 10, 8, 8.1, 7, Vista and XP on either a 32-bit or 64-bit setup. A separate x64 version may be available from Tweaking. This download was signed by Tweaking.com and distributed as tweaking.com_hardware_identify_setup.exe. We have tested Hardware Identify 2.5.0 against malware with several different programs. We certify that this program is clean of viruses, malware and trojans.